As you know, containers from seaport hinterland traffic have become indispensable. In combined cargo traffic considerable costs caused by the frequent manipulation of containers in the pre-and post-run occur. Since the largest bundling effects can be achieved by transporting bulk cargo, an innovative container should have a “self-discharge” function. This idea led to the innovative concept of the BOXmover tipping container. Your raw materials should not be transported contaminated, mixed, damaged or decimated from A to B? Assure that with the BOXmover tipping container. Again, only standardized components are installed. The container is modular prefabricated, each component is hot-dip galvanized. 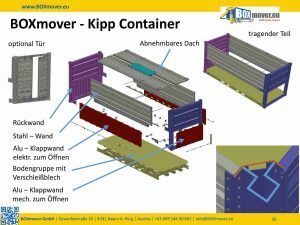 This guarantees BOXmover GmbH a durable surface that can transport any type of cargo. Build your individual BOXmover tilting container. In addition to the floor group, the front and side walls, various configuration options are available to you. Optionally, use a gull-wing door, an unwind hook lift system, a rear discharge tipping door, a closed wall or a removable roof at the front. Well, what is the USP of this container? 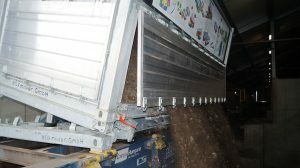 There is no bulk material left in the loading unit. This can be achieved by the innovative and patented hollow profile. The container has rounded inner corners, so that the manipulation of the bulk material is possible. Furthermore, this hollow profile has a positive effect on the stability of the container. This BOXmover tipping container is many times more stable than conventional plate container designs. In addition, this BOXmover tipping container has all ISO standards. Here you will find information about the technical conditions!